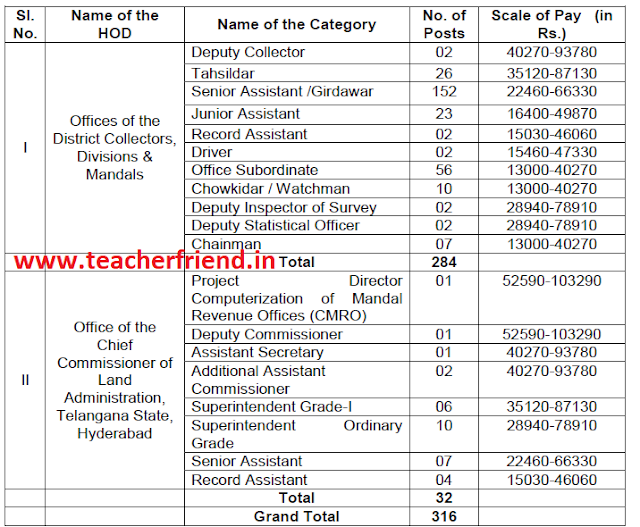 TS Revenue Department Creation of 316 New Sanction posts of the District Collectors/ Divisions/ Mandals Offices as per G.o.No:104/TS Revenue Department, Government hereby accord sanction for creation of the following (316) posts in the Offices of the District Collectors, Divisions & Mandals and Office of the Chief Commissioner of Land Administration, Telangana State, Hyderabad Issued as per G.o.No:104, Dated:23/07/2018. TS Revenue Department Creation of (316) posts in the Offices of the District Collectors,Divisions & Mandals and Office of the Chief Commissioner of Land Administration,Telangana State, Hyderabad Orders - Issued as per G.o.No:104, Dated:23/07/2018. Revenue (Ser.II) Dept., U.O.No.17629/Ser.II (1)/2017, dt.19.07.2018.